Coach Norman Dale: Welcome to Indiana basketball. David Anspaugh's "Hoosiers" is a film about the passion to excel in sports. It's also about a man's comeback to the game after a rough patch in his own life. 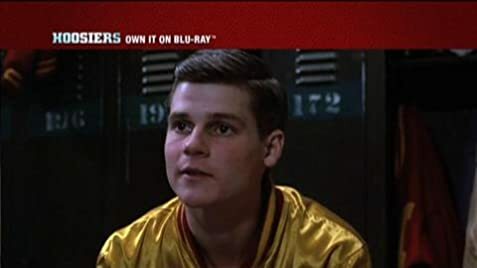 "Hoosiers" is a timeless film that will look good after years of its release because it speaks to us about how someone can inspire a group of people to do their best, as they become confident in what they are trying to accomplish. The film was lovingly written for the screen by Angelo Pizzo. Coach Norman Dale gets a reprieve in life when he is hired to coach the Hickory basket ball team in rural Indiana. Basketball is the game where most people in that state take an unusual interest. Their passion for the sport is evident. The new coach is looked with suspicion because he is an outsider and he believes in teamwork. He wants everyone to participate equally, which doesn't make for excitement in the court. The coach doesn't want anyone overshadowing another, that's why he insists in total involvement. Needless to say, his method clashes with the parents and towns people from the start. The coach's past comes to haunt him when Myra Fleener, one of the teachers, discovers an article that reveals an incident Mr. Dale would like to forget. At the same time, Myra realizes the goodness in the coach's heart by involving the drunken Shooter into helping him with the team. Gene Hackman has one of the best opportunities of his distinguished career with his portrayal of Coach Dale. He is splendid in the film and he wins us with his decency and by sticking to his principles, which he passes on to the team members. Barbara Hershey is also good as Myra, the young woman who falls in love with Dale. Dennis Hopper plays Shooter, the father of one of the kids in the team who has a drinking problem. 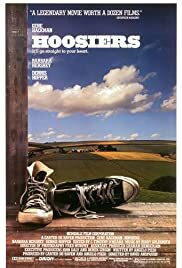 "Hoosiers" is an inspiring film that ought to be seen by young people because of its message about team spirit and how to interact with one another in peace and harmony.